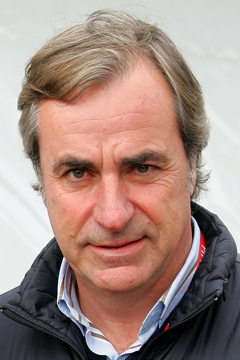 Carlos Sainz was born in Madrid on April 12, 1962. When he was 16 years old, he won the Spanish squash championship. He studied in the University of Law for two years and then, motivated by his brother Antonio and his friends Juan Carlos Oñoro and Juanjo Lacalle, he quit his studies to work professionally as a racing driver. He is married to Reyes Vázquez de Castro since 1992 and they have three children; Blanca (1993), Carlos (1994) and Ana (1998). Born to be a sportsman, he has always stood out for his great passion and ability in all kind of sports: football, golf, tennis, motocross, ski and squash. However, the world of Rallies is where he really is an expert with an uncommon talent to turn a good car into a wining machine. He is the only Spanish driver to hold the World Rally Champion title, after winning the championship in1990 and 1992. In 2007, he added a new title to his track record when he won the Transiberico Rally; the FIA Cross Country Rally World Cup. In 2010, Sainz enlarged his legend with his victory in the Dakar Rally and became the first Spanish driver to win it in the car category, milestone that he repeated in 2018, when he achieved his second victory in the 40th edition of the Dakar Rally, the most harding race in South America..